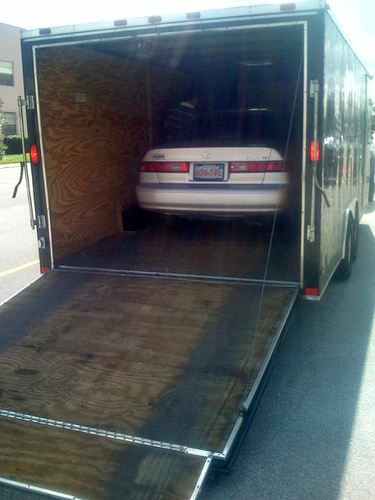 Finding a reliable vehicle transportation service is an important part of any car shipping process. The right car mover can mean the difference between getting your car to your new home safely and in a timely fashion, or having your car dinged up or damaged due to mishandling during the loading and unloading process. If you have never shipped a car before, but find that you need to do so, it is important to know what is involved in the car shipping process and how it can be a great service to you. When shopping around for auto shippers, knowing what to ask is important. This auto shippers FAQ will steer you in the right direction. The first question that you should ask any company is what region they cover. After all, an auto transport company isn’t going to do you any good if you need to get your car from Florida to California – and they only cover the East Coast. Ask every single company about the area they serve before going any further. Some companies may specialize in local moves, while others may prefer to do coast to coast shipping. What kind of documentation is necessary? When transporters assume responsibility for your vehicle, they require many different kinds of documentation to make sure that everything is “on the level.” As such, you will probably need to provide proof of insurance, a title for your vehicle, damage inspection documentation and other information to your auto shippers. I bought a car on eBay that is located across the country and I want to have it shipped to me. Will a vehicle transportation service work for my situation? If you do not want to put mileage on your new car or expose it to the many elements that you may encounter along the way, using a vehicle transportation company would be ideal. Many people ship cars they buy online and from other states all the time. Some people choose not to use auto shippers simply because they don’t know about how valuable the service can really be. If you take the fuel costs, wear and tear on a car, and the time it would take to drive long distance compared with the costs of shipping your car, you may find that vehicle transport is cheaper in the long run. Car shipping rates can depend on several factors. The first factor for pricing is distance traveled, as you will pay less to ship from Texas to Tennessee than from Connecticut to California. The second is weight; it will cost more to ship a pickup truck than a subcompact. The cost usually depends on the type of transport being used and the services offered as well. An open transport will cost less than an enclosed transfer, and a transfer to and from a large city will usually cost less than a delivery to a rural area. Be sure to discuss all of these options with each company you receive quotes from. What’s the best way for you to transport my car? Do you offer open and enclosed auto transport? Our auto transit partners offer a number of auto transport services, including open and closed carriers, as well as a variety of do-it-yourself options where you can rent equipment for your car’s transportation. Depending on the make and model of your car, you should have a discussion with the sales representative from each of the companies you get quotes for and discuss the best option for your car in terms of both price and the safety of your vehicle. Ask the transport company whether they offer open carrier shipping only, or if other options are available. Most people choose open shipping – i.e., the cars are transported without being covered up. This is a popular method among auto shippers, but can result in damages due to extreme weather or road debris. If you have a more expensive vehicle – or just want to be extra careful – ask auto shippers whether they offer enclosed auto transport. Can I transport other things inside my car while it is being shipped? Vehicle transportation companies are not licensed to transport household goods. Most people will still take a chance and put things in the trunk of their car anyway. This is not a good idea, because the driver is not responsible for these items and their insurance will not cover any loss should these items be lost or stolen while the car is in their possession. How long will it take to get my vehicle once it is picked up? Shipping times will vary by company, distance the car will need to travel, and other factors. When getting quotes from different vehicle transportation companies, ask them if they can give you an estimated delivery date. Some companies may offer to expedite your delivery for additional fees. The typical delivery time can be a few days to a few weeks. How do car haulers keep cars safe during transport on the highway? The car haulers used by auto transport companies are the same car haulers used by automobile manufacturers to transport cars from factories to dealerships. The cars to be transported are driven onto the car hauler and locked into place using specialized equipment. When your car is ready to be delivered, you or someone you designate will have to be available to receive your vehicle. This may seem inconvenient, especially if you’re in the midst of a move, but it is for your protection in case your vehicle has been damaged. Do vehicle transportation companies carry special insurance to protect my car? By law, all companies that transport vehicles are required to carry insurance. Classic and luxury cars may require some additional insurance, so be sure to check with your own insurance company to see what insurance will be in effect. Make sure the auto shipper that you choose has insurance and shows you proof of it before handing over your car to them. Never choose the services of any car transportation company that does not carry insurance. It is not only against the law, but it leaves you unprotected should your vehicle become damaged during transport. Can you explain your terms of service openly? Before signing anything with an auto shippers company, be sure to go over the terms and conditions carefully. If anything is confusing to you, ask the company to explain it more fully. My car doesn’t run at all. Can I still use a vehicle transportation service? Any car can be shipped. Transporting cars that do not run will cost more simply because the driver will need to take time and use special equipment to get these cars into and out of the carrier. This may include using winches to get it loaded onto an open car carrier, or using a lift gate to get it loaded onto a closed car carrier. Is there anything I need to do to prep my vehicle for transportation? Make sure your car is clean, both inside and out. This way, if there is any damage, both you and the driver will be aware of it. The driver will make note of any damage before taking possession of your car. Disconnect any car alarms and radar detectors before vehicle transportation. If your car is being shipped to a cold climate, add antifreeze to winterize it. It is also wise to keep fuel levels low and to notify the driver if your car is leaking any fluids prior to vehicle transportation. Is a car inspection required? Be sure to ask auto shippers whether or not a car inspection is required. Most require an inspection to be performed before assuming responsibility for it. This is highly advised for the protection of everyone involved. Now that you know what car shipping questions to ask, be sure to fill out the form at the top of the page for free car shipping quotes from reputable, licensed, bonded, and insured.